"Out of the darkness arrows whistled. Swiftly a scout rode back and reported that wolf-riders were abroad in the valley, and that a host of Orcs and wild men were hurrying southward from the Fords of Isen." 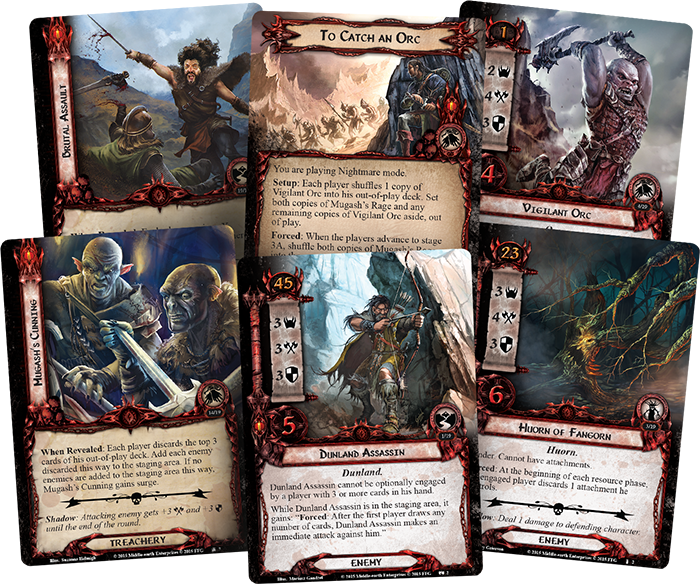 Nightmare Decks are now available for The Voice of Isengard deluxe expansion for The Lord of the Rings: The Card Game! Time does not favor the free folk of Middle-earth. With every passing day, the Dark Lord's reach grows longer, his armies grow larger, and his undying Nazgûl come closer to locating his Master Ring. Nonetheless, there are a handful of wise and powerful individuals who still hope and work to uncover some means to resist the Dark Lord. The greatest of these are the Istari of the White Council and their head, the White Wizard Saruman. It was The Voice of Isengard expansion that first gave players the opportunity to enjoy thrilling adventures undertaken on behalf of Saruman and the White Council, and its scenarios first introduced players to the Time X mechanic, Dunland enemies, Huorns, and the wild chase for Mugash, an Orc chieftain their heroes were tasked to capture alive. With mechanics that reinforced the urgency of your mission, struck back at card-draw tactics, and forced you to rip your deck apart at random and set a great portion of it out-of-play, The Voice of Isengard introduced a wealth of new themes and challenges. Now The Voice of Isengard Nightmare Decks allow you to revisit these scenarios and enjoy them once again… but this time, you face them cast headlong into the pitch-black shadows of Nightmare Mode! 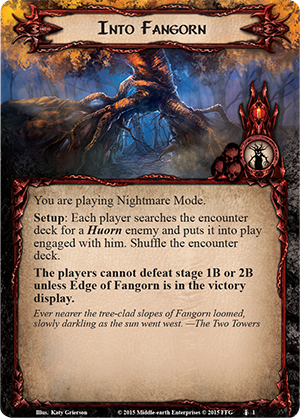 Combined into one sixty-card package, The Voice of Isengard Nightmare Decks consist of three separate decks, one to modify each of the scenarios from The Voice of Isengard. In Nightmare Mode, you face greater challenges and discover surprising twists that help evolve the scenarios in response to the successful player strategies that most commonly defeated them. How do the scenarios from The Voice of Isengard change when cloaked in the shadows of Nightmare Mode? Developer Caleb Grace offers a look, along with some insight into how they were developed. The key to defeating The Fords of Isen was to reduce your hand size below three, and then keep it small, avoiding additional card draw while you were menaced by Dunland enemies with nasty effects that triggered whenever you drew cards. Doing so allowed you to bypass most of the Dunlendings' effects and reduced the impact of all the encounter effects that got worse depending on how many cards are you were holding in your hand. In response to this strategy, The Fords of Isen Nightmare Deck includes a number of cards that limit your ability to play or discard cards from your hand, both limiting your options and making it much harder for you to get your hand size below three. 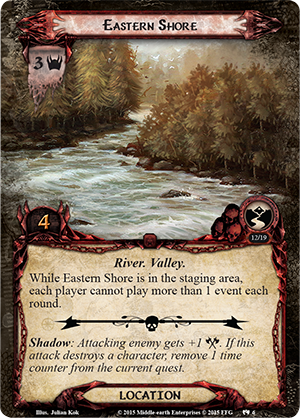 A good example of this is the Eastern Shore (The Fords of Isen Nightmare Deck, 6), which prevents each player from playing more than one event each round. The deck also includes a couple of effects that force you to draw cards when you might prefer not to. 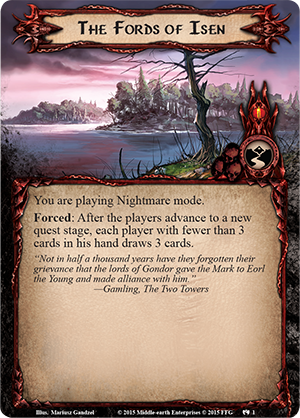 Most notably, the setup card (The Fords of Isen Nightmare Deck, 1) has a Forced effect that causes each player with fewer than three cards to draw three cards each time you advance to a new quest stage. That effect essentially guarantees that all encounter effects get "reloaded," preventing players from "solving" the scenario once and continuing forward; instead, the encounter effects are as dangerous at stages two and three as they were at stage one. 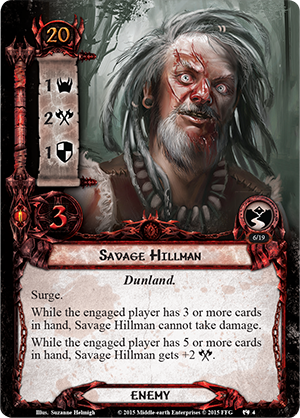 Since the scenario cannot be defeated while there are any enemies still in play, the Savage Hillman and the Nightmare Deck's card draw effects will force you to find creative new ways to win. To Catch an Orc was probably my favorite scenario from The Voice of Isengard because of how the out-of-play deck could change the way your deck came together. I loved the idea that Mugash had captured some of my allies and attachments, and I was finding my stuff in his caves as I was looking for him. I also liked how his guards could leap into play unexpectedly as I was exploring. I liked it so much that I knew right away that I wanted the scenario's Nightmare Deck to shuffle another Orc into each player’s out-of-play deck. 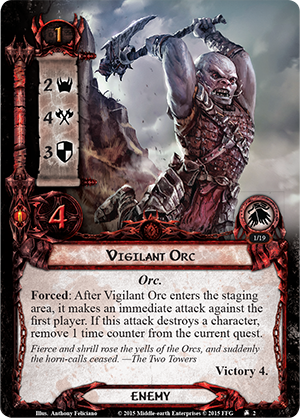 The Vigilant Orc (To Catch an Orc Nightmare Deck, 2) quickly increases the scenario's difficulty by making an attack against the first player as soon as it enters play. Not only that, but if the first player is particularly unlucky in a multiplayer game, he could face several of these Orcs all at once as they come off multiple players’ decks. 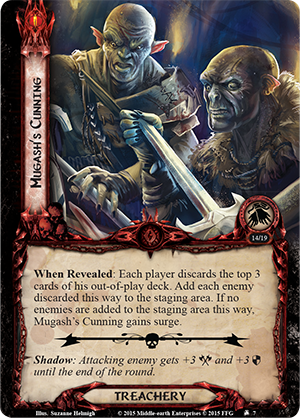 And if that wasn’t bad enough, we also included two copies of Mugash's Cunning (To Catch an Orc Nightmare Deck, 7), a treachery card that forces each player to discard the top three cards of his out-of-play deck and add each enemy discarded that way to the staging area, greatly increasing the chances that you'll find two or more copies of Vigilant Orc entering play in the same round. 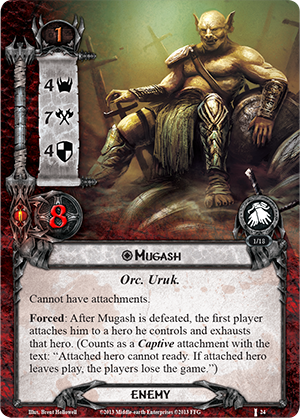 The art for this card shows Mugash breaking his bonds and attacking his captor, and that’s exactly what this card's effect allows him to do. 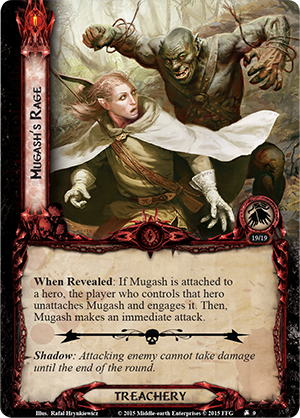 And because you need to capture Mugash in order to win, that makes Mugash’s Rage something to be feared. When we developed Into Fangorn, we wanted to make its Huorn enemies different from every other enemy in the game. In the books, the Huorns appear powerful and threatening largely because their threat is so shrouded in mystery. We never actually witness their attacks, but it is strongly suggested that they are capable of truly terrible things. We decided to reflect this by developing the Huorns as enemies that don’t attack like other enemies. Instead, they all came with the Hinder keyword and various effects that triggered at the beginning of the resource phase whenever you were engaged with them. This made them different, but it also reduced some of the threat they presented; because Huorn enemies don’t make regular attacks, players often ignored their attacks in order to quest with more characters and progress more quickly along the quest. So there really is no escaping from the Huorns in Nightmare Mode! 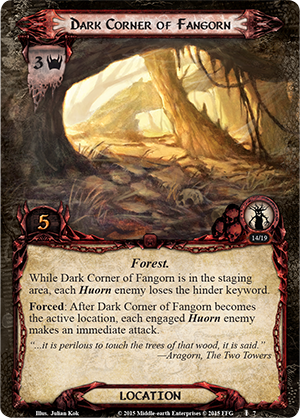 And just to make sure that you need to be wary of Dark Corner of Fangorn and the wrath of the scenario's Huorn enemies, the setup card (Into Fangorn Nightmare Deck, 1) instructs each player to search for a Huorn and put it into play engaged with him. That also means you will have to deal with those Huorn effects that trigger at the beginning of the resource phase from the very first turn. That change by itself is probably enough to make the scenario twice as difficult, but the rest of the nightmare cards won’t make it any easier! While very few of the cards from The Voice of Isengard Nightmare Decks directly target the Time X keyword, there's no denying that they add to the intensity and urgency that the Time X mechanic added to The Voice of Isengard and its scenarios. You were always undertaking perilous adventures with the threat of doom hanging over you, as a terrible army was massing unseen beyond the Ash Mountains to the east. You were always fighting past evils in order to buy the White Council and the free folk of Middle-earth just a glimmer of hope. Now, in Nightmare Mode, your quests are even more perilous. They are more difficult, and the foes and obstacles you face are even harder to overcome. You just don't have more time. Instead, your time is running out. Don't delay! 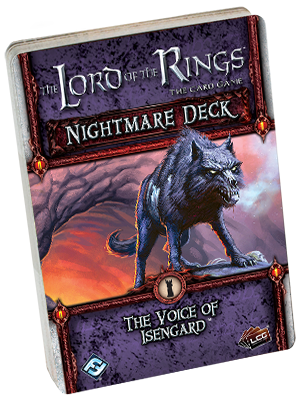 Pick up your copy of The Voice of Isengard Nightmare Decks today!